Watching a talk from Square's CTO Bob Lee, I just learned about Dagger, a new dependency injection framework for Java and Android which is currently in the works at Square, Inc. Considering the number of existing DI solutions in the Java space  e.g. CDI, Google Guice and Spring  one might wonder whether the world really needs yet another DI framework. According to Bob's talk, Dagger (a pun on "directed acyclic graph") is the attempt to create a modern and fast DI framework based on the insights gained during development and usage of Guice (Bob was the founder of the Guice project at Google). And indeed does Dagger come up with some quite interesting ideas which I'd like to discuss in more detail in the following. Dagger is centered around the annotations for dependency injection defined by JSR 330 (which Bob Lee co-led). This is a good thing because it increases portability of your code between different DI solutions. To satisfy dependencies, Dagger creates the required objects using their @Inject-annotated constructor (in turn creating and passing any dependencies) or the default no-args constructor. DI frameworks usually make intensive use of reflection to examine annotations, find injection points, create managed objects etc. While reflection today isn't as expensive as it used to be in earlier years, it still can take a considerable amount of time to create large object graphs with lots of dependencies. Dagger tries to improve upon that with the help of code generation. It provides a JSR 269 based annotation processor which is used at compile time to create an adapter class for each managed type. These adapter classes contain all the logic required at run time to set up the object graph by invoking constructors and populating references to other objects, without making use of reflection. This approach promises performance benefits over reflection-based ways for creating object graphs typically used by DI frameworks. 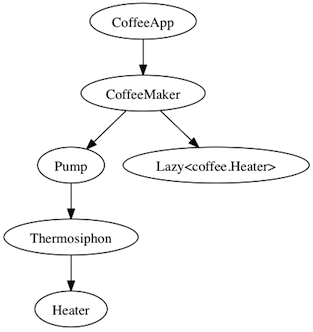 On my machine Dagger needed roughly half the time to initialize the graph of the CoffeeApp example using the generated classes compared to using reflection (which it also supports as fallback). Of course this is by no means a comprehensive benchmark and can't be compared with other frameworks but it surely shows the potential of the code generation approach. The annotation processor also performs a validation of the object graph and its dependencies at compile time. So if for instance no matching type (or more than one) can be found for a given injection point, the build will fail with an error message describing the problem. This helps in reducing turn-around times compared to discovering this sort of error only at application start-up. Implementing this sort of checks using an annotation processor makes them available in IDEs (which typically can integrate annotation processors) as well as headless builds, e.g. on a CI server. Dagger is a new dependency injection framework for Java and Android. While it's still in the works (the current version is 0.9 and there are still some apparent bugs), I find the concept of using an annotation processor for validating the object graph at compile time and generating code for a faster initialization at runtime very interesting. In particular on mobile devices fast start up times are essential for a good user experience. I also like the idea of leaving out features which might provide some value but would add much complexity. One thing I'm missing though is some sort of interceptor or decorator mechanism. This would be helpful for implementing typical cross-cutting concerns. It'll definitely be interesting to see how the code generation approach works out in practice and whether other DI solutions possibly adapt that idea. While thinking about how to take advantage of Bean Validation within JavaFX 2 based applications, I just learned that JavaFX is actually part of the JDK installation since Java SE 7 Update 2. The latest JDK (Update 5) comes with JavaFX 2.1.1. Now to the bad news: as it seems the installation doesn't contain the JavaFX API sources or JavaDocs. But that's not really a problem, as a ZIP with the sources can be downloaded from OpenJFX's Mercurial server and the latest Javadocs can be found here. The Spring framework has in general an excellent documentation. One exception to me is the reference guide's chapter on Spring AOP, which I personally find not as comprehensible as other parts of the documentation. What I'm missing in particular is a complete example demonstrating how to use Spring AOP together with AOP Alliance MethodInterceptors. Where possible, I prefer to use AOP Alliance compliant interceptors over other Spring AOP advice types, as they foster interoperability with other AOP frameworks compatible with the AOP Alliance API, such as Google Guice. So without further ado, an example for using AOP Alliance method interceptors with Spring AOP is shown in the following. By specifying the @Component stereotype annotation, the interceptor is enabled to be detected automatically by the Spring container using component scanning. Here the interceptor is applied to all invocations of methods defined within the de.gmorling.moapa.springaop.service package and its sub-packages. But the pointcut could also be more fine-grained and match only methods on specific types or even single methods. Note that the AspectJ weaver JAR and  when applying interceptors to classes  CGLIB 2 need to be on the class path. A complete sample Maven project can be found on GitHub.